"For ten long years now we have laid siege to Troy and still they defy us!" The Tardis arrives near the city of Troy and witnesses the climax of a battle between Achilles, a Greek, and the Trojan Hector. Leaving the Tardis the Doctor is mistaken for Zeus and taken to the Greek camp by Achilles and Odysseus where he meets Agamemnon and his brother Menelaus, who is the husband of Helen who has been abducted by Paris of Troy, bringing Greece & Troy into an extended conflict which Agamemnon hopes that the Doctor, as Zeus, will help them win. 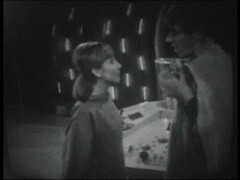 Steven follows the Doctor,leaving the injured Vicki, who sprained her ankle in the previous episode, in the Tardis. Steven is first observed by the Greek spy Cyclops, captured and about to be killed when the Doctor insists that he is taken to "his Temple" in the morning where he will show them a miracle. The mute Cyclops has entered and through sign language tells everyone that "Zeus' Temple" has vanished. We English love so it was only a matter of time before Doctor Who had a go picking the well known tale of the Trojan Horse. But given that this is sixties television all the Greeks sound like they have upper class English accents with Achilles, Cavan Kendall, being a particularly bad offender sounding exactly like the comedian Kit Hesketh-Harvey who you may know from Just a Minute. 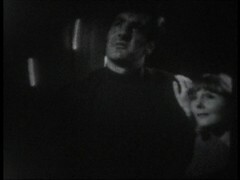 Achilles is on the right in the above photo, with Hector, briefly played by Alan Haywood, on the left. As for me the episode is a little pedestrian reminding me very much of the classic serials of my youth, but with a little humour injected into it! Menelaus, played by Jack Melford, was married to Helen of Sparta who was abducted by/eloped with Paris, Prince of Troy. Menelaus is also Agamemnon's brother and he leads an expedition to Troy, which includes a number of Greek heroes and, besieges the city for ten years. 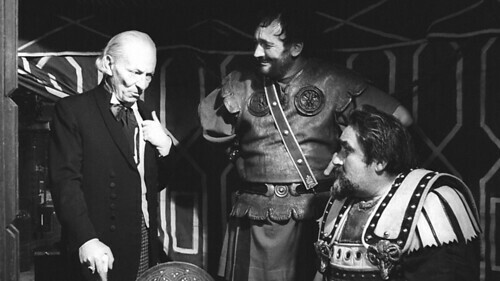 The two main Greek commanders, Agamemnon and Odysseus, both have prior Doctor Who form: Odysseus, in the middle, is played by Ivor Salter who was the Morok Commander in the last two episode of the Space Museum, The Search & The Final Phase and later returns as Sergeant Markham in Black Orchid: Part Two. My thanks to m'learned colleagues at Roobarbs DVD forum for identifying who was who in these photo. If you look carefully at the one in the tent above you can see the tent pulled up to Hartnell's left and what is probably the base of a camera visible through it. Sadly there's no photo of the Cyclops: when I first read the name in The Programme Guide years ago I was expecting a mythical figure with one eye in the centre of it's face: turns out it's just a man, missing one eye! There's a lot of extras used for this serial, which doesn't really come across in the audio recordings, and many of them have who form. Of the ones used in this episode Pat Gorman, who's been in everything, needs no introduction. 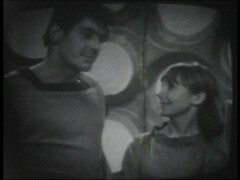 Both Derek Chafer and débutante Peter Roy, who also has Blake's 7 episodes to his name have long associations with the show: look at their linked IMDB profiles for exactly what they've been in while John Freeman returns in The Massacre 2 & 4, The Sea Beggar & Bell of Doom as a Guard and Gary Wyler was a Thal in The Dr Who and the Daleks feature film alongside one of the cast that's introduced in the next episode. 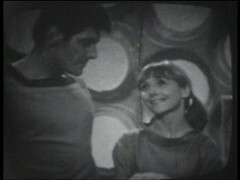 This episode, and indeed no episode from this story don't reside in the BBC archives. There aren't any telesnaps either so all we have are the soundtrack, some publicity photos and some brief 8mm film recorded of the serial's Australian broadcast. Like most of the 8mm footage it's pretty pedestrian showing just the Tardis crew, in this case Vicki & Steven as they watch the Doctor on the scanner and the same pair again as Steven, having changed clothes, prepares to leave the Tardis to follow the Doctor. There are a number of new names of the credits this week: Producer John Wiles had been involved for a while now and had fallen out with the cast during the production of Galaxy Four. His tenure would be quite short involving clashes with the stars and his management at the BBC. This is Michael Leeston-Smith only Doctor Who story and so, because of the Myth Makers is missing from the archives, becomes the first director we've encountered to have no representation today. This is also writer Donald Cotton's first story and he'll be back for more later in the season.